Beef, water, natural hickory wood smoke, vinegar, salt, onion, garlic, black pepper, dark red chili, hydrolyzed soy and corn protein, sugar, caramel color, molasses, papain, citric acid, crused red pepper, dill seed, MSG, paprika, cayenne pepper, and mustard seed. The first flavors I pick up are a salty soy sauce, mixed with smoke flavor and garlic. The vinegar starts to come through afterwards, along with touches of cayenne and dill. The chewing brings on the natural meat flavors, along with a bit more of the dill and vinegar. There's a light bit of heat going on in the background. For being labeled, "Kickin' T-Bone" and described as being "reminiscent of a perfectly prepared Texas T-Bone steak", I'd say that it lives up to that billing. First of all, it's certainly kickin' because there's a lot of flavors going on, including touches of chile pepper heat. 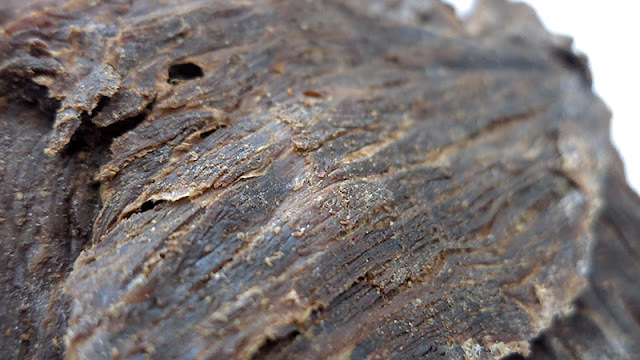 But it does have a steak-like chew and flavor, and definitely something more bold and seasoned, like you'd expect to find in a Texas steakhouse. Otherwise, the primary taste profile is that of salt, with a significant soy sauce, vinegar, and smoke flavor. The dill and garlic is noticeable, with touches of cayenne and black pepper. The natural meat flavors certainly make a showing in the background, and sometimes I find some fat flavors that mix in for a more satisfying experience. The level of heat rates on my personal scale as "mild medium" (level 2 out of 5). 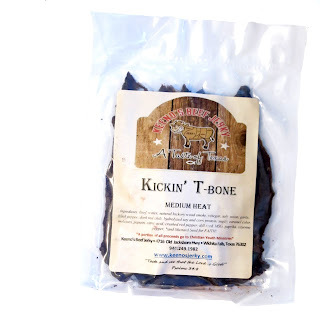 This Kickin' T-Bone beef jerky from Keeno's punches out of a lot bold flavors, just like what you'd expect to get from a jerky made in Texas. It lives up to its name of being "kickin'" for its light heat and variety of ingredients. It also chews and tastes like a well-done cooked T-bone steak. I find it too heavily salted for my liking, and defintely requires a beverage to wash it down with. Otherwise, I like the addition of dill and vinegar which makes this tangy, and I like the smoke flavor and touches of heat. It has nice steak-like chewing texture, but countered with a fair amount of stringiness. 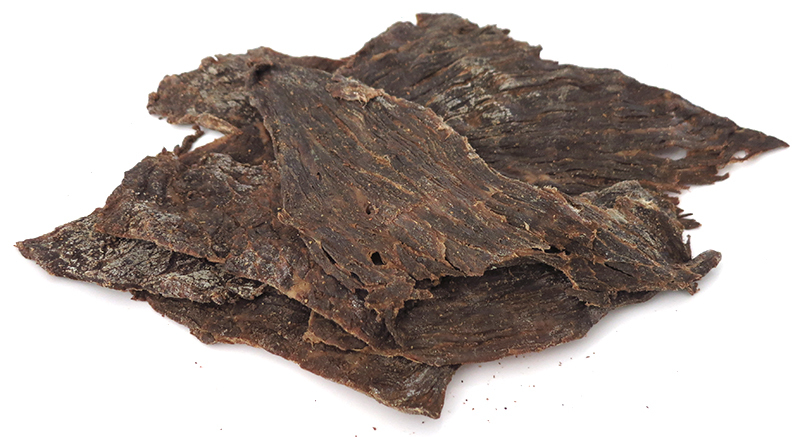 This company has the best jerky around! They have 15 flavors, which are all amazing, so you should be able to find something you'll rave about! I suggest you try all their wonderful flavors! I give them 5 out of 5 stars!